Wide high-speed streets can create a barrier to walking to school. This is the type of condition that should NOT occur along a child’s route to school. 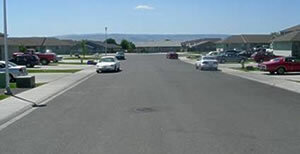 High-speed motor vehicles pose a serious threat to the safety of children who are crossing streets. One of the biggest challenges in providing children with safe walking and bicycling routes to school involves slowing down traffic. Slower motor vehicle speeds allow drivers to stop in a shorter distance and reduce the chance of injuring a pedestrian or bicyclist. A motor vehicle traveling on a level surface at a rate of 40 miles per hour (mph) will need nearly 300 feet between the car and the child to stop in time to avoid a collision. This distance is reduced to approximately 197 feet for a car traveling at 30 mph, 112 feet for a car traveling at 20 mph and 77 feet for a car traveling at 15 mph [AASHTO, 2001]. Relationship between motor vehicle speed and braking distance when traveling on a level surface [AASHTO, 2001]. 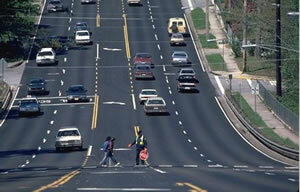 Pedestrian crash severity is also much lower at low motor vehicle speeds. If a pedestrian is struck by a car traveling at 40 mph, there is an 85 percent likelihood that the pedestrian will be killed. This percentage drops to 45 percent at 30 mph and 5 percent at 20 mph. Thus, slowing motor vehicle speeds not only reduces the chance of a crash due to the shorter stopping distance that is required, but it also reduces the chance of a pedestrian fatality or serious injury [UK DOT, 1987]. The relationship between pedestrian injury severity and motor vehicle impact speeds [UK DOT, 1987]. Which street has lower speeds? 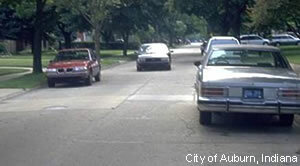 The street on the bottom with street trees and a narrower pavement width will naturally result in slower driver speeds. When slowing or ‘calming’ traffic, the right design invites the right driver response. The guiding principle of traffic calming is to influence motorist speeds and behavior through good design, rather than by traffic control measures such as traffic signals and STOP signs.